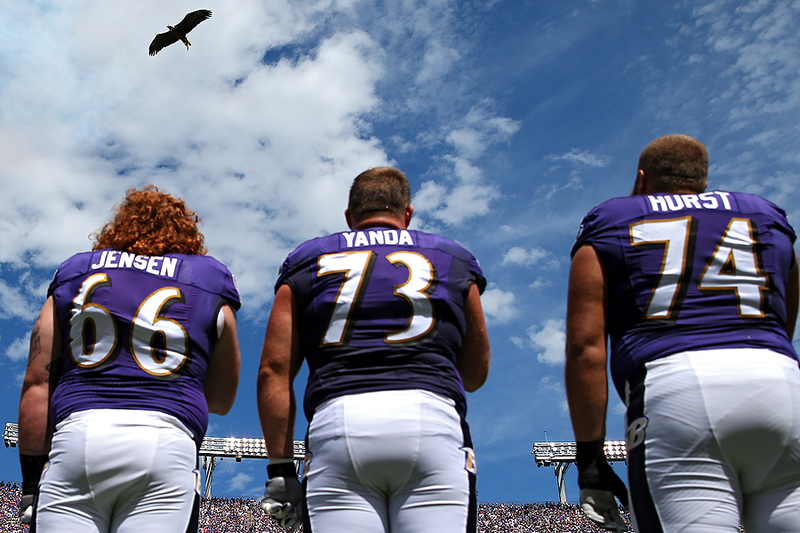 "Marshal Yanda #73 of the Baltimore Ravens and teammates stand during the national anthem as a bald eagle flies above before playing the Buffalo Bills at M&T Bank Stadium on September 11, 2016 in Baltimore, Maryland." One thing never changes in American professional sports - the game always begins with the national anthem. However, of recent, it has become a news topic as select athletes have been taking a knee during said anthem with hope of raising awareness of social injustice. While this controversial topic evolves, it's our job as photographers to continue to document what happens before the game begins. Last Sunday, before the Buffalo Bills played the Baltimore Ravens, there were no protests. But in staying alert, a bald eagle, which typically symbolized as American pride, was trained to fly above players during the anthem. While no players opted out of the anthem, I thought the image helped tell the other side of this ongoing story that players are still standing.